Discussion in 'Ride Reports - Day Trippin'' started by Terry500RS, Jan 28, 2019. 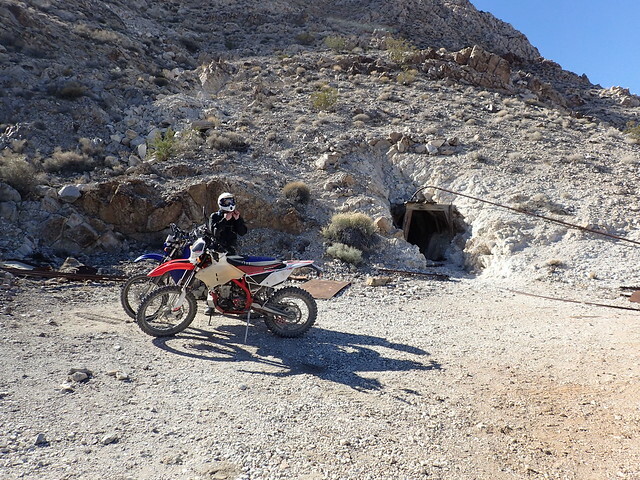 We have ridden through Southern Death Valley a couple of times on Jerry Counts rides http://www.dualsportwest.com/ I was interested in the areas North of Stove Pipe Wells that contained the Ubehebe Crater, Teakettle Junction and the Race Track. I recently retired and Matt was on vacation so we decided to go to Death Valley. The main planning issue I noticed was gas availability while studying available open tracks. 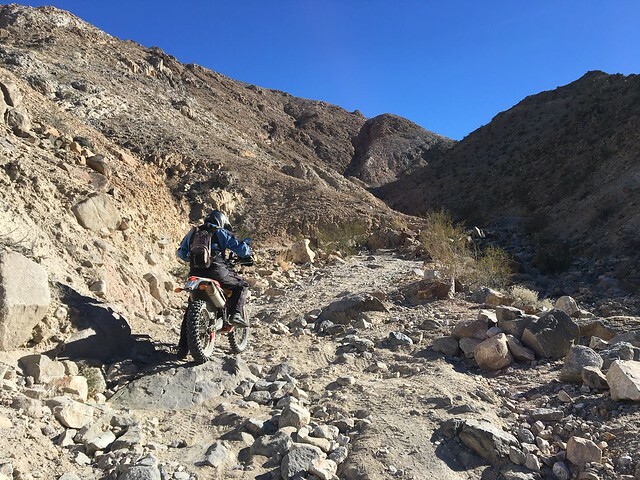 We picked Panamint Springs https://www.panamintsprings.com/ as our base. They have gas, cafe, lodging and a campground. By using Panamint as our base we could then fuel in Stove Pipe Wells and Big Pine for 150 to 200 mile loops. There are riding opportunities in almost any compass direction from there. We were looking forward to at least a weeks worth of riding. The day after New Years we left for Panamint Springs. 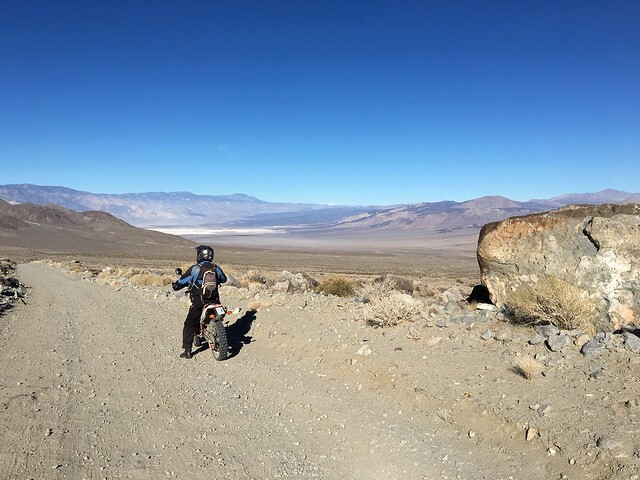 For our first ride we decided to do a Saline Valley, Lippincott Pass, the Race Track and Ubehebe Crater loop. We put all of our warm layers on and headed up the road. We stopped at Father Crowley Lookout to take in the view. A couple of miles further up the road we came to the turn off for Saline Valley road. It is an easy and dusty dirt road. About 15 miles further along we came to the unmarked turn off to Hunter Mountain road. 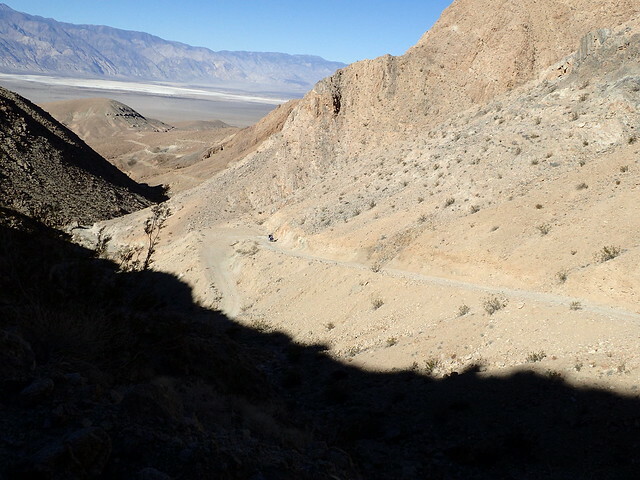 We keep to the left and headed down into Saline Valley. To our surprise we came upon some patches of ice about 50 feet long covering the width of the dirt road. I slowed down to a crawl in first gear aware not to make any sudden moves on the bike. After crossing about six patches of ice it all came apart. It happened so fast it was just a blur. The rear tire swung around and the next thing I knew was high siding off the bike and slamming into the ground. I picked myself up and could feel my ankle was pretty painful. I could stand on it but not bend it. When Matt caught up to me He said He had gone down also with no injuries. I decided finishing the ride was doable. 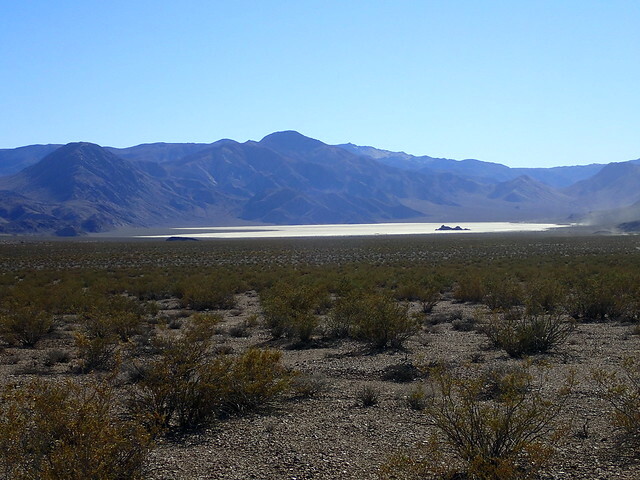 We continued down into Saline Valley and turned right onto Lippincott Road. There where some decent sized rocks on the switch backs up the mountain. Matt at the switch back. We turned right at the top and went about a mile to the Lippincott Mine. After taking a break at the mine we continued North about 10 miles to the Racetrack. 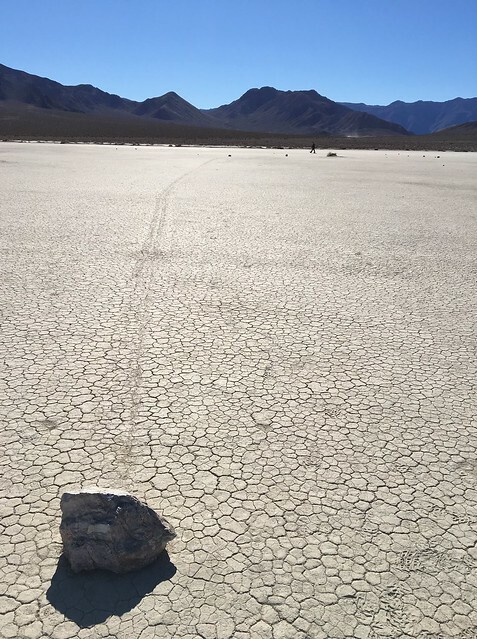 It’s the famous dry lake with the rocks that leave long tracks behind them. 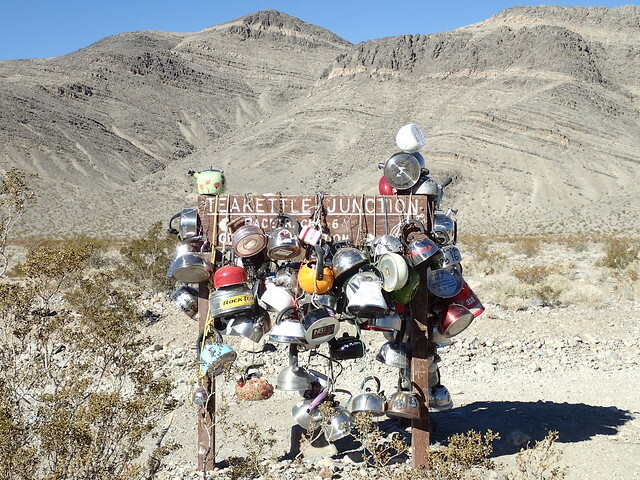 A few miles North of the Racetrack was Teakettle Junction, another must see. 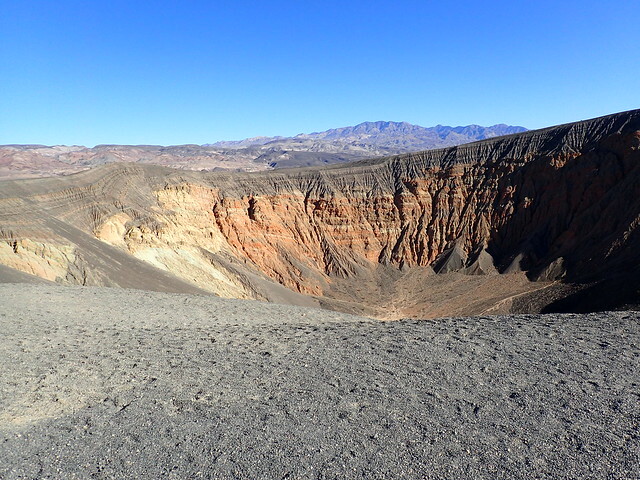 We continued another 35 miles up to Ubehebe Crater, another unique geologic feature. From Ubehebe Crater to gas at Stove Pipe Wells would be about 65 miles on the road. We got back around 3 PM covering 158 miles for the loop. For reference the longest leg was Panamint to Stove Pipe Wells at 120 miles. The loop was awesome, we finally got see some of Death Valleys other iconic features. Wish I could have finished out the week but We left the next day, my ankle wasn’t any better. An x-ray showed a chipped bone on the ankle. Hope you enjoy the pictures. N-Id-Jim, rjnutt, The Virginian and 5 others like this. Good write up, bummer about cutting the trip short due to injury. I'm heading out at the end of February with family and friends for a week of riding out there. Should be a perfect time of year. i saw the title of this thread and thought, “sweet! 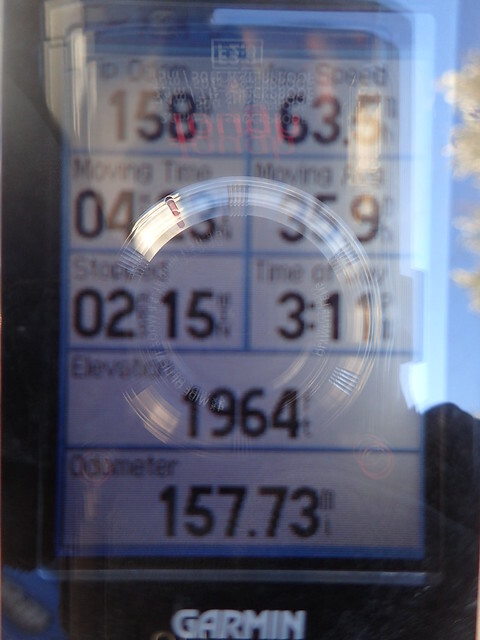 i love death valley and inter-generational ride reports!”... sorry it came to an unfortunate end. heal well. Hope to make it out with my 20yo next spring as it is on our bucket list. One question...what type of footwear were you in? Seeing your pictures and reading the names of those places brings back wonderful memories of a trip I did back in ‘16. 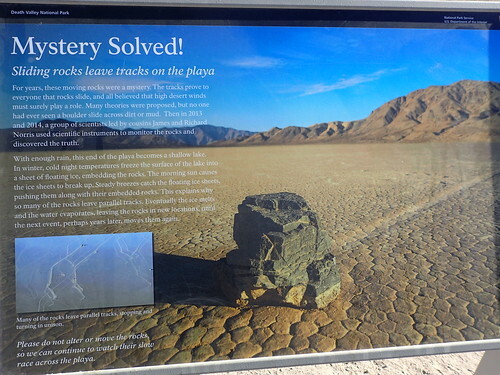 We based at Panamint too and it was a great spot for exploring what we could. When you get back there, I’d recommend doing an overnight at Saline Valley hot springs, fantastic place to relax after a long day of riding. What a great write up and like others have said, sorry you had to cut it short and heal up. Thanks for sharing.